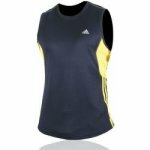 This is a super lightweight and breathable mens running singlet with an enhanced anatomical fit for optimum performance. ClimaLite Technology: A soft lightweight fabric providing superior moisture management. ForMotion: 3D engineering for enhanced fit and performance. The is ideal for training and running in. Keeps you warm with Duotech fabric. Overlapping material panels provide the singlet with a unique look. DuoTech provides the warmth despite the open style. 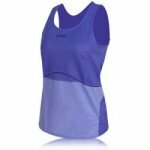 Flat seams and shaped side seams - for reduced chafing and rubbing of the skin when exercising. Nike Pro signature at neckline - makes this stand out. 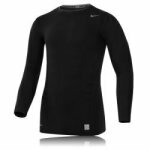 Lightweight technical long sleeve tee in hydrator fabric providing excellent stretch and wicking properties. 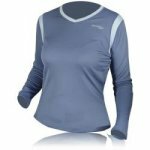 Flat seam construction, shifted side seams and shaped hem for improved fit coverage and style � a great base layer thermal. The inner muscle technology is a unique ASICS invention that helps to train specific muscles and improves movement and posture. The top stabilizes scapula movement and improves upper arm lift. It can help to give you better posture. It can help to reduce the chance of injury. Is recorded to increase breathing volume and oxygen intake efficiency by 5%. ClimaCool technology provides superior ventilation through a 360 degree cooling system. Formotion - developed by Adidas using innovative new cuts and three-dimensional engineering create sculpted garments that optimise fit an comfort and boost freedom of movement. 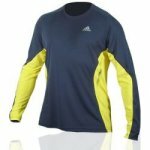 Great styling in this short sleeve running top. 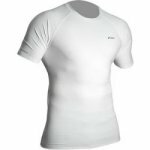 Hydrator fabric provides great stretch and breathability. Mesh side panels improve mobility and wick moisture. Flat seam construction provides enhanced comfort. 7 inch invisible front zipper adds visibility.